After an election that may go down as the most democratic in the history of Central Asia to date, Kyrgyzstan now faces the messy business of forming a government. According to a provisional count, six parties cleared the 7-percent vote threshold in the October 4 election, thereby securing their place in the 120-seat parliament. While that outcome may ensure a broadly representative legislature, President Almazbek Atambayev and other figures close to the Social Democratic Party (SDPK), the leading vote-getter with 27.4 percent of the ballots, likely greeted the results with disappointment. Speaking after casting his ballot, Atambayev expressed hope for fewer parties. “So that the government doesn’t change every year, it would be preferable for there to be no more than three parties,” he said. The other parties that got into parliament are Respublika-Ata Jurt (20 percent), the Kyrgyzstan party (12.9 percent), Onuguu-Progress (9.3 percent), Bir Bol (8.5 percent) and Ata Meken (7.8 percent). Forming that coalition is going to require numerous hatchets to be buried — deep-seated personal enmities and rivalries abound in the often-murky world of Kyrgyz politics. SDPK representatives have been more circumspect on coalition options. “There is no concrete position as yet about the parties with which we will be forming a coalition. We are awaiting the official conclusion of the parliamentary elections,” SDPK leader Chynybai Tursunbekov was quoted as saying by Radio Free Europe/Radio Liberty’s Kyrgyz service. A definitive vote count is expected by the end of the week, election officials say. Local and international observers are in broad agreement that the election was an anomaly for Central Asia. “These lively and competitive elections were unique in this region as, until 8 o’clock last night, nobody knew what the composition of the parliament would be,” said Ignacio Sanchez Amor, head of the Organization for Security and Cooperation in Europe’s short-term observer mission. The marked decrease in fraud was ensured in part by the introduction of biometric registration, which required voters to submit to a fingerprint check before they could cast their ballot. That appears to have cut down on multiple voting, which was a prevailing feature of earlier elections, but the OSCE said there was still room for improvement. Authorities will have time to address shortcomings before the next vote — a presidential election in 2017 — but other urgent matters will not wait. Economic decline in Russia, where hundreds of thousands of Kyrgyz migrant laborers earn their living, is already making itself felt in Central Asia. “That is why it is necessary, within two-three months, to quickly review the main political documents, including the sustainable development strategy,” Edil Baisalov, a political activist with a past of working in the government, wrote in a snap post-election analysis. Baisalov said the law enforcement and judicial systems are in desperate need of revamping. “You cannot fight corruption and clean things up with (dirty law enforcement) bodies,” Baisalov wrote. In a report published on the eve of the election, International Crisis Group identified a worrying laundry list of problem issues, including persisting ethnic tensions, corruption, unchecked nationalism and a surge of political Islam. ICG predicted apocalyptic scenarios in the event of a failure to act. “Violent unrest, which would become a real risk, could quickly have an impact on both immediate neighbors and wider international partners, particularly Russia, which could be called on to intervene,” the organization said in its report. Although the parliamentary election results are not yet finalized, some political operators may already have an eye on the 2017 presidential battle. President Atambayev is limited by the constitution to only one term and will have to step down, unless any surprise changes to the law are adopted between now and then. The president’s power in Kyrgyzstan was ostensibly diluted and shared with parliament as a result of constitutional changes following the 2010 revolution. Even so, the post remains an important political prize. 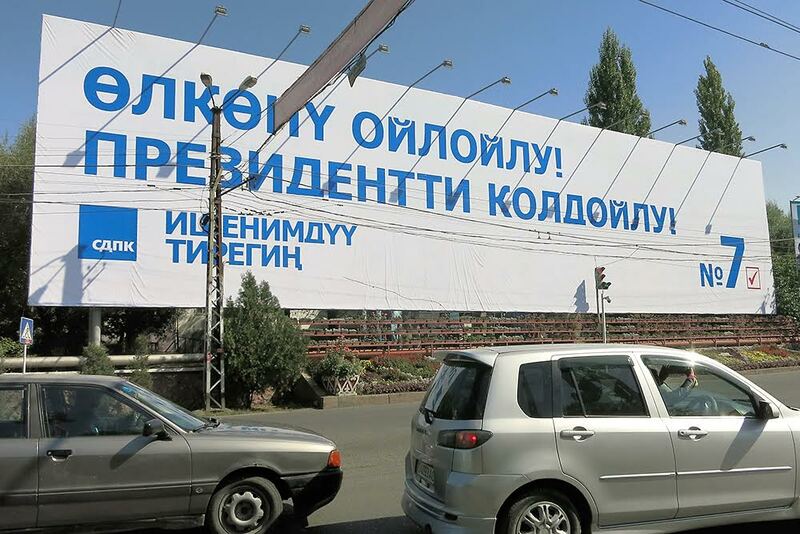 “This [parliamentary] election was in effect the first round of (the 2017) election,” business and political consultant Azamat Akeneev said in a post on his blog. He added that the parliamentary election results made Babanov — joint leader of the second largest party in parliament, Respublika-Ata Jurt — a strong early favorite in the presidential race. “Many will now be looking to open channels to him and offer him their support,” Akeneev wrote. Peter Leonard is EurasiaNet's Central Asia editor.